(NewsUSA) - Today, parents are increasingly allowing their children to use tablets and smartphones at younger ages. In fact, nine in ten 6-12-year-olds in the US have access to tablets or smartphones, and two out of three use tablets or smartphones on a daily basis. But parents often have questions and concerns about how their kids use them and which apps are appropriate. 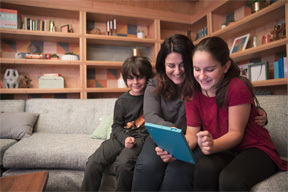 Whether it's using video chat to talk to grandparents, staying in touch with cousins who live far away, or sending mom a decorated photo while she's working late to say "hi," parents want safe messaging options that are also fun for kids to use. Messenger Kids, which launched this month in the US on the App Store, is the latest solution to answering these parents' needs. "After talking to thousands of parents, associations like National PTA, and parenting experts in the US, we found that most feel there's a need for apps that let kids connect with people they love, but also have the level of parental control parents want," says Loren Cheng, Product Management Director. Connection. Apps are a great way for children to connect with the people they love. With Messenger Kids, kids can video chat and message with parent-approved contacts once their account is set up by a parent. Creativity. An app should be fun, and should allow kids to express themselves within the limits set by parents. Messenger Kids features a library of kid-appropriate and specially chosen GIFs, frames, stickers, masks and drawing tools that let them decorate photos and videos and have more fun with live video chats. Control. Messenger Kids helps ease parents' concerns about how children are using devices and whether they are using apps that are age-appropriate. It also gives parents more control. Parents fully control the contact list and kids can't connect with people that their parent does not approve. Convenience. Apps, especially for kids, must be easy to setup and use. Messenger Kids was designed with input from thousands of parents and over a dozen expert advisors in the areas of child development, online safety, children's media and technology. Once the account is established, the home screen shows kids at a glance whom they are approved to talk to, and when those contacts are online. For more information, visit messengerkids.com.